FTP accounts allow you to access your website’s files through a protocol called File Transfer Protocol. You will need a third-party FTP program to access your files. FileZilla is one such free FTP solution that you can download and install on your computer to access your account files. There is also list of FTP programs on Wikipedia that you can check and install the one for your operating system (Windows or Mac). Once FTP program is installed on your computer, you can log in via FTP by entering your domain name as your FTP host and the username and password of the account you wish to log into. This is the login that is provided in your welcome email when you signup for the hosting account. If you have forgotten the username/password, please contact our support to have it reset. FTP program has two windows in it that shows you local and remote files. You can upload local files to the remote server or download remote files to your computer. You can edit files locally and once you are satisfied with the changes, with a click you can upload the file on remote server and it will be instantly available on the website. There are some Special FTP Accounts that you can see in your cPanel. These are linked to aspects of your hosting account. Your main account is tied to the main login for your hosting account, logs accounts allow access to raw usage logs, and anonymous accounts allow anonymous access to your files. Special FTP Accounts have special restrictions and cannot be deleted. By creating additional accounts you can give access to your colleague or friend to upload files or maintain a section of the website they are responsible for. You can create any number of accounts at Webx Networks. 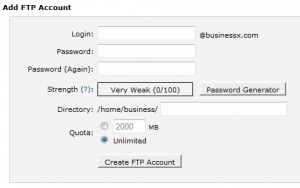 You can create additional FTP accounts and restrict the access to a particular folder in your account. Your master or main ftp account has access to entire account files. FTP is a great tool to manage your website. Many Website editing tools e.g. Dreamweaver has built-in support for FTP. You can upload files directly from Dreamweaver. This saves time managing another software and editing files in one and uploading it through another. When you are looking for a website editing tool, you should check if it has built-in ftp support. Although we also provide File Manager with cPanel where you can edit files on the fly within cPanel interface.